Should I Take Medications for Sleeping Problems? If you've ever experienced a sleeping problem, you already know that they're difficult to cope with. Whether you can't fall asleep to begin with or wake in the night for hours, it can definitely damper your quality of life. Sleep disorders - whether they be sleep apnea, insomnia, or just a bad night of worry - affect upwards of 80% of Americans on a yearly basis. There are many options for managing sleep disorders, including lifestyle changes, herbal remedies, and prescription medications. Several types of medications are frequently prescribed for sleep disorders. The most commonly used are sedatives and hypnotics, called benzodiazepines. These became available in the 1970s and have been popular since for their sedative effects. Doctors also prescribe patients antidepressants or anti-anxiety medications, since both of these emotional conditions are linked with insomnia. In some cases, individuals are put on both antidepressants and benzodiazepines at the same time, depending on the circumstances and medical history. Over-the-counter medications are also available, and they are the most popularly utilized form of medication. This is likely because of how easy they are to access. Many people have found initial success with these drugs, but they may lose efficacy with extended use. One of the most notable risks when it comes to medications for sleeping problems is dependency. Because the body gets used to benzodiazepines over time, they may become less effective. For this reason, some people start to up their dose without their doctor's direction, which can lead to drug abuse and overdose. Other potential, less common side effects include headaches, constipation, heartburn, memory loss, irritability, and uncontrollable shaking. Lifestyle choices can have a significant impact on your sleep quality when night falls. There are several tips to keep in mind in order to regulate your cycle. For one, make sure to have a regular sleep patterns; going to bed and waking up at the same time each day promotes regularity. Click here to read on five bedtime rules to overcome sleep disorders. Also, do not consume caffeine or alcohol four to six hours before bed. Finally, do not exercise or eat a large meal two hours before you are going to sleep. Finally, try adding mindful meditation to each day to ease anxiety. 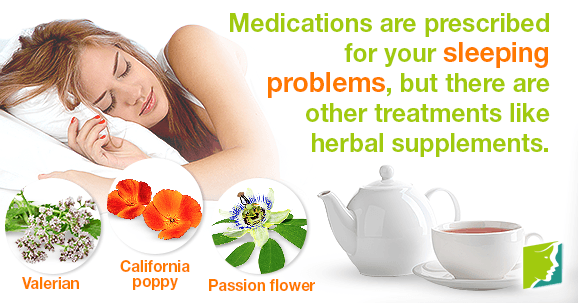 Some medicinal herbs have a soothing effect on the body that is known to induce sleepiness. Plants have been used for millennia to treat sleep. They work with your natural processes to help restore balance to your brain chemistry and emotions, thereby improving your slumber. Some herbal teas that are known for their sedative and relaxing effects are valerian, California poppy, and passion flower. A good night's sleep is essential for proper mental functionality and mood. Medications are widely available and heavily prescribed, but there are other forms of treatment available as well. You may find that herbal supplements and lifestyle shifts are the most positive way to deal with your sleeping problems. Certain foods and drinks may help promote sleep and help bring about sleep; one ideal combination is an oatmeal cookie and a warm glass of milk. Narcolepsy causes the suffer to fall asleep at unexpected times throughout the day. Click here to learn more.